It's World Tiger Day tomorrow (the 29th of July)! 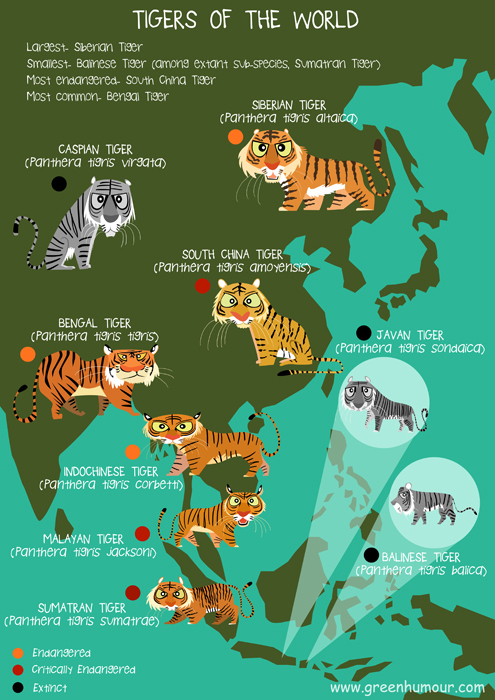 The tiger is undoubtedly the world's favourite animal, but many of us are probably not aware of the fact that the species is distributed into 9 sub-species across South and South-East Asia and the Russian Far-East (I myself could never recall the 9 names each time someone asked me what the races were, and so I decided to draw this poster!). These are the Siberian, Caspian, South China, Bengal, Indochinese, Malayan, Sumatran, Javan and Balinese Tigers. The Siberian Tiger is the largest tiger in the world, while the Sumatran the smallest (taking the title away from the Balinese after its unfortunate extinction in the middle of the 20th century due to hunting). More unfortunate is the fact that all races of tigers today are either endangered or critically endangered, and the South China Tiger is already presumed to be extinct in the wild. While the Bengal Tiger is the most common race compared to its other cousins, the animal itself is endangered with a constantly shrinking distribution. The caricatured poster illustrates the 9 sub-species and roughly plots their respective home-ranges. Note that the range of the Caspian Tiger extended farther into the west, along the Caspian Sea, but these areas have been left out since the race is now extinct. What struck me while drawing the poster was that I was having to render three beautiful animals- the Caspian Tiger, the Javan Tiger and the Balinese Tiger, black-and-white to indicate that they are extinct today. What a pity it is that the three animals do not feature in their original orange-and-white glory, but I hope these ghosts serve as a reminder to me and you that we need to ensure that the other 6 tigers remain coloured on the map! The prints are available as posters and merchandise. For international orders, please visit my Redbubble store here. Can't we shame the Chinese into no longer eating and believing in any benefits of parts of the tiger ? They played a crucial part in the White Rhino's near extinction, even eat dolphins and now they are indifferent to the fate of the tiger. They take good care of Pandas because they bring them a lot of money. So - is the path to the heart of a Chinese cobbled with money ? Should we, must we, pay them to protect the last South China tigers ? I commend your efforts to put the spotlight on the fate of our world's tigers. I wish you continued success and exposure. Thank you. Todosloa animaled on muy importantesen los ecosidtems y drbrmos trstar de condervar a todos por ihual.